Not only a perfect writing instrument - your own small museum, which is always with you ! BREAKING NEWS - We will be participating FIRST time in Chicago Pen Show in Chicago, IL, USA from May 1 till 5th, 2019! Let us know to artuspen@inbox.ru that you would like to join, and please do mention the models or type of pen models you would like to check in person (so we make sure to have them with us, no ANY buying obligations, 100%) email artuspen@inbox.ru for details!!! Be the first to see our brand new special flex 14K gold nibs matching the oversized pen models! See you soon!!! We are pleased to inform you that Artus pens received Best Cultural Historical Theme of The Year 2018 Award in the 24th Annual Readers’ Choice Awards competition sponsored by PEN WORLD magazine: American Eagle and Buffalo - Best Cultural/Historical Theme; Established in 1994, the Readers’ Choice Awards is the only international awards program for the pen industry and is based on the votes of PEN WORLD readers. A panel of long-time PEN WORLD readers served as judges, carefully selecting the nominees from a long list of pens featured in the magazine during 2018. There are twelve different categories of recognition and five nominees within each category. Artus was already awarded Best Tribute Pen of The Year 2017 by the readers of Pen World magazine (one of a kind fountain pen Monumental Michellangelo)!!!!! Check our new largest N8 18 k gold nibs with ebonite feeder installed and one of a kind solid silver with handmade enamel clips of your choice! Have a look at the new line of LE rollerballs with solid silver body and ebonite tube incorporated! Hope to meet you soon! Attention!!! We are pleased to inform you that Artus pens nibs N6 could be chosen from now on between EF and stub 1.1mm size as well. We have full range of nib sizes of your choice!!! 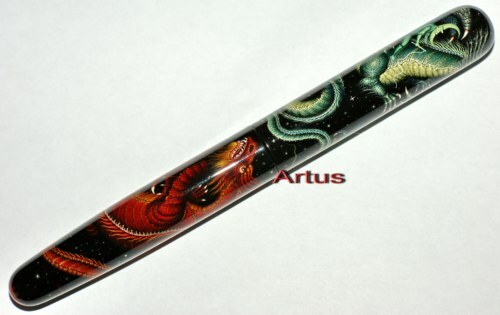 Artus pens ship worldwide via courier trackable registered airmail DHL or EMS post 3-7 business days! We have updated our website with many new models in April, check "One of a kind pens", "Urushi Pen Cases" and "Unique Artus pens" sections in Showcase (see above). We install individual one of a kind solid silver clips now on our oversized pen line, even with hand done coloured cold enamel on top! We accept Paypal, credit cards and wire transfers. We are pleased to inform you, that Artus pens is the only one handpainted pens brand to receive TWO years in a row Best Fine Art Pen of The Year from Pen World magazine 2013 and 2014 Readers' Choice Award!!! we are located in the middle of Russia, near the art villages, other companies which make handpainted pens come here from time to time to order - so we could offer atleast two times better prices, just check it by sending the request and compare yourself. Check Artus pens on Facebook and Like us to get free regular trackable shipping during 2019! NEW - Check Artus pens on Instagram!